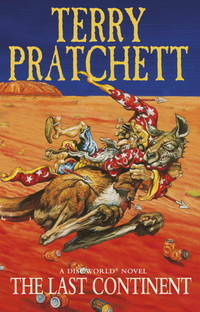 TERRY PRATCHETT is the acclaimed creator of the global bestselling Discworld series, the first of which, The Colour of Magic, was published in 1983. In all, he is the author of over fifty bestselling books. His novels have been widely adapted for stage and screen, and he is the winner of multiple prizes, including the Carnegie Medal, as well as being awarded a knighthood for services to literature. Worldwide sales of his books now stand at over 75 million, and they have been translated into thirty-seven languages. Paperback. New. With the best and most interfering minds of Unseen University somehow left in charge at a critical evolutionary turning point, the Discworld's last continent needs a saviour... Who is this hero striding across the red desert? Sheep shearer, beer drinker, bush ranger, and someone who'll even eat a Meat Pie Floater when he's sober. Corgi. Used - Good. Ships from the UK. Former Library book. Shows some signs of wear, and may have some markings on the inside. 100% Money Back Guarantee. Your purchase also supports literacy charities. Corgi. Paperback. 0552167606 Please allow 4 - 14 business days for Standard shipping, within the US. Thank you for supporting our small, family-owned business! . New. 2013-11-04. Corgi. Paperback. 0552167606 Please allow 4 - 14 business days for Standard shipping, within the US. Thank you for supporting our small, family-owned business! . Fine. 2013-11-04. Corgi. Paperback. 0552167606 Please allow 4 - 14 business days for Standard shipping, within the US. Thank you for supporting our small, family-owned business! . Fair. 2013-11-04. 2013-11-04. Good. Ships with Tracking Number! INTERNATIONAL WORLDWIDE Shipping available. May not contain Access Codes or Supplements. May be ex-library. Shipping & Handling by region. Buy with confidence, excellent customer service!